Cranberry infused vodka! Comes together in a flash and doesnt require days of soaking. Make a great gift too! Begin by making simple syrup. Mix 1 cup sugar and 1 cup water in a small sauce pan. Bring to a boil and simmer for about a minute until all the sugar is dissolved. Pour fresh cranberries and 1 1/2 cups water into a blender. Place wire mesh strainer over a medium size bowl. 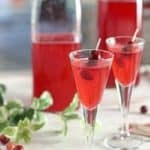 The juice from the cranberries is what you will be using to flavor the vodka. Pour cranberry slurry into mesh pushing through with a rubber spatula until all juice has been extracted. Toss remaining cranberry pulp. You should end up with about a cup and a half of juice. Combine cooled simple syrup, vodka and extracted cranberry juice. Leave at room temp overnight to steep. Pour into decorative containers and garnish with cranberries.